This wonderfully eccentric church looks like no other in the world: it rises up in a tall, neat, three-storey rectangle. It was built on the site of ancient San Michele ad Hortum (popularly reduced to ‘Orsanmichele’), a 9th-century church located near a vegetable garden, which the comune destroyed in 1240 in order to erect a grain market; after a fire in 1337 the current market building (by Francesco Talenti and others) was erected, with a loggia on the ground floor and emergency storehouses on top where grain was kept against a siege. The original market had a pilaster with a painting of the Virgin that became increasingly celebrated for performing miracles. The area around the Virgin became known as the Oratory, and when Talenti reconstructed the market, his intention was to combine its secular and religious functions; each pilaster of the loggia was assigned to a guild to adorn with an image of its patron saint. In 1380, when the market was relocated, the entire ground floor was given over to the church, and Francesco Talenti’s talented son Simone was given the task of closing in the arcades with lovely Gothic windows, although these were later bricked in. Orsanmichele grew into a magnificent showcase of 15th-century Florentine sculpture, a style book of the innovations that succeeded one another throughout the decades. Each guild sought to outshine the others by commissioning the greatest artists to sculpt their patron saints and the elaborate canopied niches that hold them. Most of the figures are copies; the originals have been stored in the Bargello or in the Orsanmichele museum on the upper floors. From Via de’ Calzaiuoli turn left on Via de’ Lamberti to see the work that got the ball rolling: Donatello’s St Mark, patron of the linen dealers, finished in 1411, and the first free-standing marble statue of the Renaissance; note the subtle contrapposto position that makes the figure ‘escape’ from the confinement of the niche. 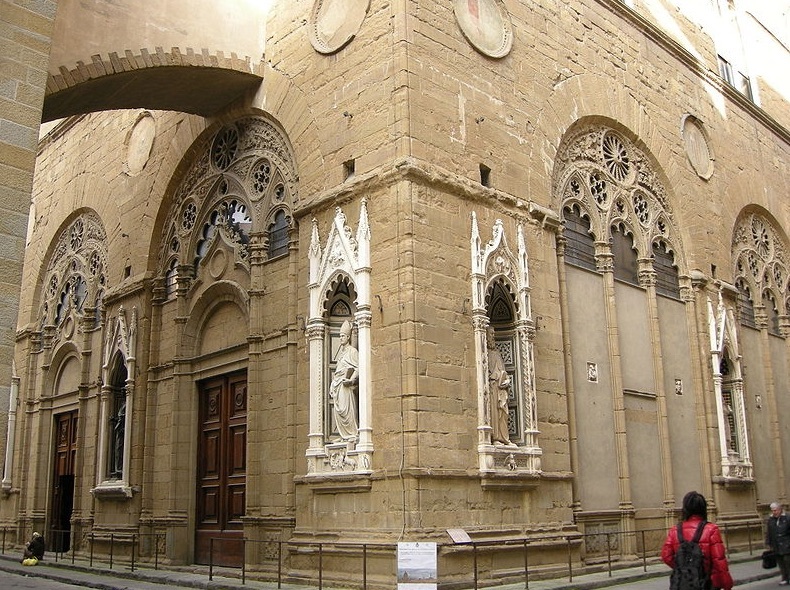 The niches continue around Via dell’Arte della Lana, named after the Wool Merchants’ Guild, the richest after that of the bankers; their headquarters, the Palazzo dell’Arte della Lana is just opposite and linked to Orsanmichele by an overhead passage. The first statue on this façade of Orsanmichele is St Eligio, patron of smiths, by Nanni di Banco (1415), set in a niche embellished with the guild’s emblem (black pincers) and a bas-relief below showing one of this rather obscure saint’s miracles – apparently he shod a horse the hard way, by cutting off its hoof, shoeing it, then sticking it back on the leg. The other two statues on this street are bronzes by Ghiberti, the Wool Guild’s St Stephen (1426) and the Exchange Guild’s St Matthew (1422), the latter an especially fine work in a classical niche. 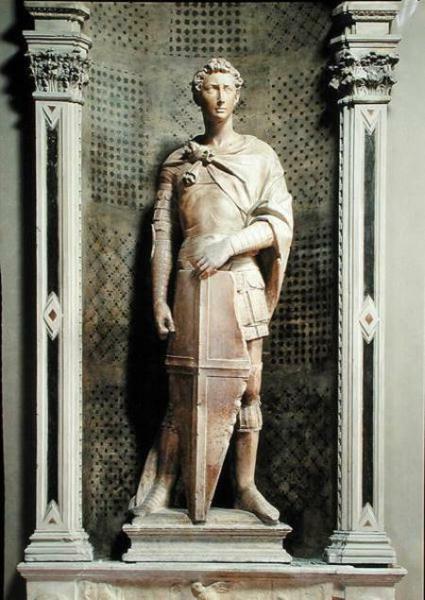 This has a copy of Donatello’s famous St George (the original is in the Bargello), rippling with prontezza sculpted in 1417 for the Armourers’ Guild. The dramatic predella of the saint slaying the dragon is one of the first-known reliefs making use of perspective. Next are the Stonecutters’ and Woodcarvers’ Guild’s Four Crowned Martyrs (1415, by Nanni di Banco), inspired by Roman statues; by making them appear in an intimate conversation, Nanni managed to wedge them all in their niche. He also contributed the Shoemakers’ St Philip (1415), while the next figure, St Peter, is commonly attributed to Donatello (1413). Around the corner on Via dei Calzaiuoli stands the bronze St Luke, patron of the Judges and Notaries, by Giambologna, the last statue added to Orsanmichele, in 1602. Facing Via dei Calzaiuoli, in a 15th-century niche, that originally held Donatello’s St Ludovico, is the picturesque Doubting of St Thomas by Andrea del Verrocchio (1484), made not for a guild but the Tribunal of Merchandise, who like St Thomas always wanted to be certain before making a judgement. In the tabernacle of the cloth merchants, or Arte di Calamala, is Ghiberti’s St John the Baptist, the first life-size bronze cast since antiquity. In the rondels above some of the niches are terracottas of the guilds’ symbols by Luca della Robbia. Orsanmichele’s dark interior is ornate and cosy, with more of the air of a guildhall than a church. 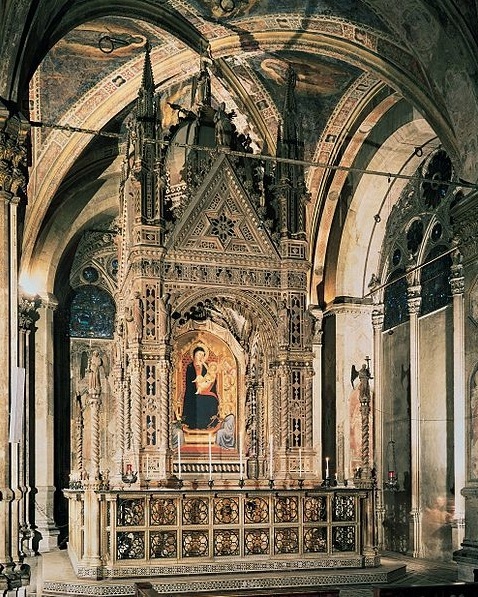 It makes a picturebook medieval setting for one of the masterpieces of the trecento: Andrea Orcagna’s beautiful Gothic Tabernacle, a large, exquisite work in marble, bronze and coloured glass framing a contemporary painting of the Madonna (either by Bernardo Daddi or Orcagna himself), replacing the miraculous one, lost in a fire. The Tabernacle was commissioned in thanksgiving by survivors of the 1348 Black Death. On the walls and pilasters are faded 14th-century frescoes of saints, placed as if they were members of the congregation; if you look at the pilasters on the left as you enter and along the right wall you can see the old chutes used to transfer grain from the storeroom above. The lower half of the church has another high altar, this one with a curious statue of St Anne with the Virgin on her lap with Jesus on her lap by Francesco da Sangallo. Hours Church daily 10am-4.55pm, closed Mon in Aug. Museum: open Mon only, 10am-4.45pm & Sat 10am-12.30pm.